I’ve been stamping for over 10 years now and I’m so excited to know that you are interested in giving Stamping a try. You don’t have to be “Crafty” to do this. I know it can be overwhelming but it’s much easier than you think and I’m here to help you!. It’s a fun, creative hobby that you can do by yourself or with friends. “It’s a fun and creative hobby that you can do by yourself or with friends.” When you create a card and share it with someone you are letting them know – you care. Below is more information that will help you get started! You Need 3 Things To Stamp! Stamps set come in all sizes and shapes. Whether it’s a picture of a butterfly or sentiment saying “Best Wishes”, this is where stamping begins and is the focal point of what you are creating. A quality cardstock allows for the creation a clean and vibrant stamped image. 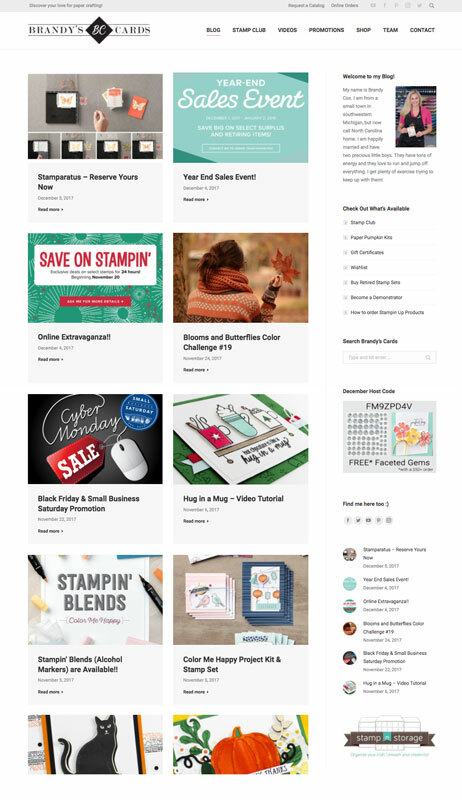 Stampin Up sells some of the highest quality cardstocks in the industry. If you sign up for my mailing list, whenever I publish a new video, I will send you a link straight to your inbox. To the right is an example of some of my free videos. I hope you enjoy them. Let me know if you have any questions, you can always contact me here. Next, I would recommend visiting my blog. This is the home of all of my projects and videos. Here is where you can also learn about all of the different clubs, promotions and programs we have available.Thank you so much for visiting BrandysCards.com. I hope to hear from you!